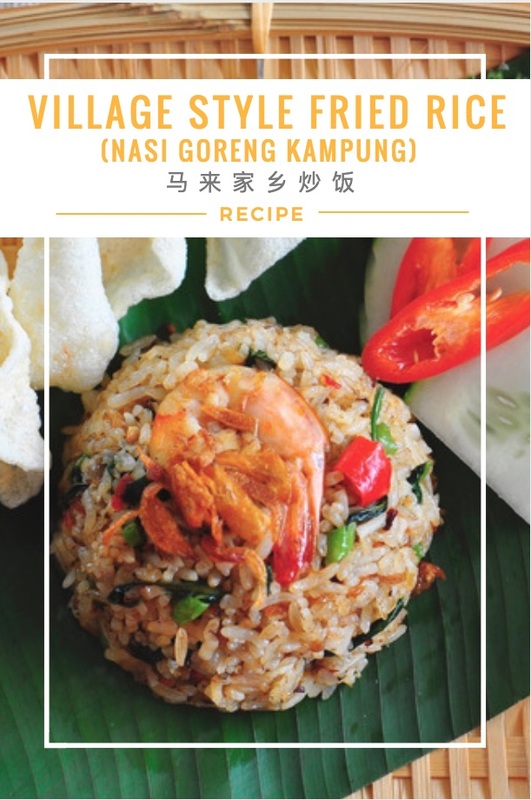 Village style fried rice, otherwise known as Nasi Goreng Kampung is a Malay style fried rice. It is commonly cooked using leftover rice. However, you can also use freshly cooked rice as well. Just be sure the rice is thoroughly cooled. Long beans, water convolvulus (kangkung), dried prawns and shrimp paste, which are always featured in Malay cooking are used together in this Malaysian style fried rice dish. Cooking this dish is pretty easy. First, pound or blend the spices. Then, just heat up a wok with cooking oil and fry the blended ingredients till fragrant. Add the peeled shrimp, vegetables and crushed chillies. Fry till just cooked. Lastly, add the cooked rice and seasonings. Stir fry till thoroughly mixed and cooked through. And we’re done! Serve immediately garnished with some fresh cut cucumbers and prawn crackers. 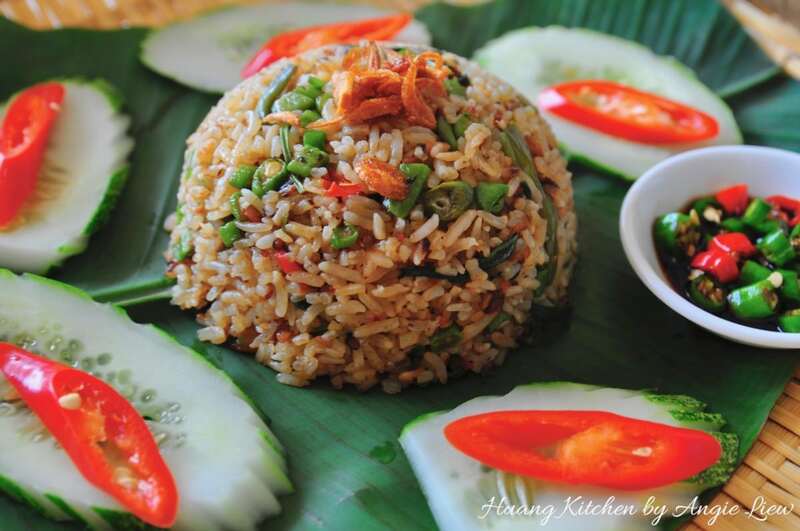 Village Style Fried Rice is a popular Malay style fried rice: Nasi Goreng Kampung. Long beans, kangkung, dried prawns, shrimp paste are stars in this dish! Measure 3 bowls of cooked rice, preferably long grain rice into a large bowl. Using wet hands, give the rice a quick mix. This helps to break up clumps in rice. Cut water spinach into sections and dice long beans into small pieces. Peel shrimp shells with the tail intact. Then, crush bird eye's chillies. First, soak the dried shrimps till softened and drained well. Deseed chillies, peel garlic and shallots. Then cut into big pieces. Blend chillies, garlic, shallots, dried shrimps and toasted shrimp paste for about 3 seconds. Alternatively, it can be pounded. Set aside the spice paste. To fry the rice, first heat up wok until it's really hot. Then add in oil. Fry the spice paste until lightly brown and fragrant. Add water spinach, long beans, peeled shrimps and bird eye's chillies. Stir fry for a while and mix well. Then, add in the cooked rice. Stir fry and toss the rice around to ensure it is evenly mixed with other ingredients. Then add in salt and fish sauce. Continue to toss and stir fry for about 5 minutes. And we're done! Serve while hot. Garnish with crispy fried shallots and prawn crackers on the side. As always, Enjoy! You can use dried anchovies instead of dried shrimps for this recipe. You can adjust the amount of chillies used to your preference. The ground paste can also be ground using mortar and pestle. To save time, using a blender is fine as well. Just ensure the paste is coarsely blended and not too fine. If using water spinach (kangkung), use only the tender leaves and the top part of the stem. Discard stems closer to the roots as they can be quite tough.